Before you bring a pair (or more!) of new little friends home, it is important to make sure you are set up with all the right kit to look after them. Most important is buying a suitable cage. Here are some things to think about when it comes to rat cage requirements. How big does a rat cage need to be? What size bar spacing should a rat cage have? Is a tall or wide rat cage better? How easy will the cage be to clean? Most pet rats will spend the majority of their time in their cage – sometimes up to 22 or 23 hours a day. So, it needs to be big enough to give them plenty of space to explore and express their natural behaviours. The exact cage size depends on the number of rats you have. I currently own 25 rats living in a single group, so my cage is… big. Really big. In fact it is three large multi-level cages joined together by industrial size drain pipe, with another three ferret cages waiting to be connected. The aim is to give my rats a complete environment, with lots of different areas to dig, tunnel, climb, run, sleep and forage for food. However, it takes up a whole room, and I admit it would probably be overkill for a normal rat owner! The first thing to do when you’ve found a cage that interests you is to put its dimensions into a cage calculator to check how many animals it can comfortably accommodate. Remember that a rat cage calculator gives you a minimum suitable size – if it says a cage is suitable for 3 rats, it means it is not suitable for more than 3, not that 3 rats wouldn’t be more comfortably housed in a larger cage. It might not come as a surprise that when it comes to rat cage size, I favour bigger as better. However, big cages are only helpful to rats if they are well laid out to take advantage of the space. Getting your cage set-up right is as important as choosing the right size cage. Many cages that are a good size for rats are designed for other, larger, animals and so can have fairly large spaces between the bars. It is important to get the bar spacing on your cage right, otherwise your rats might hurt themselves or escape. The best bar spacings for rats are 0.4 – 0.6 inch / 1 – 1.5 cm. These are small enough to keep young rats and small females in. Whether you have horizontal or vertical bars is a matter of human taste – my young and old rats happily climb either. Cages with bar spacings of 0.8 – 1.0 inch / 2 – 2.5 cm can sometimes be used for adult rats, especially males, but they can be risky with smaller animals. Rats can fit through any gap they can get their heads through and I’ve seen rats get out through gaps that your eyes will tell you wouldn’t be possible. I do have three cages with 0.8 inch / 2 cm bar spacing designed for ferrets and dating from when I only kept adult rescue boys. However, nowadays they are fully meshed, including the base and the roof, with plastic coated chicken wire. That works really well and means I can still use them with my mixed group, but it was a lot of work, as the mesh has to be wired to the cage with small loops of garden wire at regular intervals to make sure the rats can’t push it off or squeeze under it. If you are buying a cage new, I’d recommend just getting one with smaller bar spacings! This question depends mainly on where you are planning to keep your rats, as the shape and size of the cage may be dictated by the space you have in your house. Short but wide rat cages such as the Savic Freddy cage often work better for people who need to put the cage on top of a table or dresser, while taller cages on stands can work better if the cage needs to stand-alone on the floor. Of course, I’m in favour of tall and wide cages, but owners need to choose what will suit their living arrangements while still meeting their rats’ needs in terms of space. Even the best behaved and litter-trained rats will make a mess in their cage, and you’ll need to clean it out at least once a week. 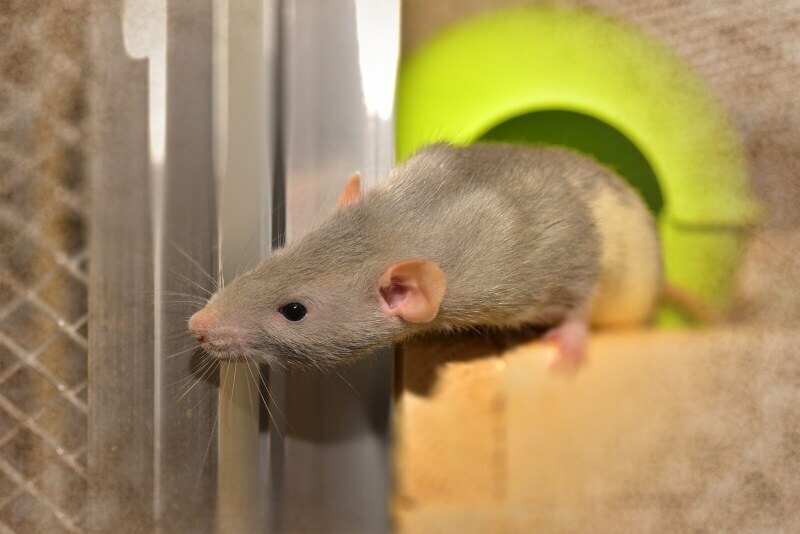 From nearly 20-odd years experience of keeping rats, I can say with confidence – choose a cage that will be easy to clean. Your back and shoulders will thank you for it. Look for cages with large doors, where it is easy to access all the corners, and where litter trays and soiled bedding will be easy to replace. For large cages, I love a cage like the Critter Nation. Two of the three cages in my current mega-cage follow this design, which has doors that allow the front to fully open. This makes cleaning ridiculously easy as you can just open up and sweep out. It also means that large digging boxes, and cage furniture like wooden wine racks are easy to add. I have one cage set-up with the original middle floor (so it is a multilevel cage), and one set up without any shelves so it is an open climbing space with hammocks and ropes. To make furnishing the cage easier, I keep one door on top and bottom closed during use, so I can still attach hammocks and boxes to the front of the cage. For people with smaller groups of rats, it is possible to buy Critter Nation (and similar designs in different countries) as a 2 door single story cage. Anything advertised for rats and mice. If it is suitable for mice, it is going to be too small for rats. Wooden hutches / converted wooden cabinets or bookcases. Wood is not a good material for rat cages. Firstly, they will chew it, and may well escape – I once took in a half wild little boy whose mother had been kept in a wooden hutch in an outhouse with inevitable results involving a hole in the cage and the local wild Casanova. Secondly, wood absorbs rat wee, which will make it stinky quickly and be hard to clean. Glass or plastic tanks, or any enclosure with poor ventilation. Rats suffer very easily from respiratory disease and key in keeping them healthy is a clean cage with plenty of fresh air flow. Rat cages should mainly be made from barred metal. although a plastic base of 4-6 inches / 10-15 cm in height is fine to put substrate in, as long as you don’t own chewers! Winner: Critter Nation (or other metal cage with similar design and bar spacing – I have one cage branded as a Critter Nation and a one as a Ferret Kingdom (available in Australia). The only real difference is the door catches. Other brands include the Liberta Explorer, and the Savic Royal Suite – links to Amazon.co.uk). Runner-up: Liberta Happy House – available on Amazon.co.uk (outside of Europe cages of similar design are sold under different brand names, or branded for birds). Along with my Critter Nation and Ferret Kingdom, one of these forms my current mega-cage, and although it has smaller main doors than the critter nation, they are big enough to allow good access for cleaning (note – I’ve wired most of the small doors shut to make sure no one learns to open them!). Winner: Critter Nation single story (most of the brands above like the explorer also do a single story cage so it is worth looking at what is available in your country). Runner up if space is an issue and you need to put your cage on a dresser or table: Savic Freddy 2 Max – available on Amazon.co.uk (the Freddy 2 is also a great cage for a small space, but only suitable for 2 rats). This is a european cage, but similar designs are available elsewhere in the world. I had a cage of this size and design back in the days when I only had 3-4 rats and it worked really well.